Last night the New Zealand rugby team, the All Blacks, beat the Australian rugby team, the Wallabies (watch highlights here). This makes me happier than many other things that people derive pleasure from. I was raised in New Zealand, where rugby, to employ a bad sports cliche, is not a religion, but the religion. When I moved to the American South, first Virginia and now my current home, Florida, I was told that people think of college football as a religion. This is both impossible and untrue, because a) there is much more to distract people from college football including “real” religion and b) there are other sports that people are extremely passionate about for no discernible reason, such as baseball. Now that I have talked about a sport that most Americans don’t care about and derided the so-called national past time, it seems appropriate to mention that I am nonpretentious.com‘s new sports writer. And I don’t really like baseball, at least not yet. And I live in Gainesville, Florida, so I am somewhat preoccupied with the University of Florida’s athletic program. Also, the only two sports scenarios that might cause me to become completely irrational is the play of the All Blacks and the Boston Celtics. So, now that I have made the case that I am somewhat/completely unsuitable to be a sports writer, let me reiterate that I am. A sportswriter and an unsuitable sportswriter. Thus let me start with some old thoughts on some old news. Jesse Jackson was right, at least to some degree, when he critiqued Dan Gilbert. The bitching and moaning of Gilbert, the owner of the Cleveland Cavaliers, about Lebron James’ move to the Miami Heat reeks of some deeper anxiety: an inability to control another person’s movement and right to seek employment elsewhere once a contract expires. You are a fool, Gilbert, a sore loser, a petty name-calling fool, and I’m glad big Z, the Cav’s center, is taking [his] talent” to Miami, too. I watch much more basketball than I should–in fact, I’m embarrassed to say how much I watch. I will, however, say this. All this watching allows me to assert something with a fair amount of certainty: LBJ is one of the best passers in the game. Would he have been one of the best passers in the league in the early 1990s? I don’t know. Is he a better passer than Magic Johnson? Probably not. But you wait until this Miami Heat team is on the fast-break. . . Win or lose—and they have to win, really, or the sharpened knives will start slashing—there will be artistry. But then you might not care about basketball, which is okay. As I said before, I don’t really care for baseball. At least not yet. I watched the Home Run Derby at the MLB All Star game. It was pretty good, I guess. Gilbert’s letter wasn’t about ownership or slavery, it was about being a fan. He was empathizing as a fellow fan of the Cavs how much it hurt to be left behind and in such an obscene spectacle. LeBron had every right to leave and pursue other opportunities, yes, but he threw his decision in the faces of his hometown fans in order to build up his own legend (in a “broadcast” pretty much universally considered to be tasteless and shameful). The point is that he’s not the humble, team player, home town boy that everyone wanted to call him. He’s bought into his own legend and as self-proclaimed NBA fan, you saw him quit on the court this past playoff season too. Dan, I think it’s how you say…naive to say that Dan Gilbert’s letter isn’t about ownership. Perhaps Jackson took it slightly too far by equating him to a slave owner, but things like that happen when you have white men in positions of power over black men. It’s called historical context. I’d link to a definition of it, but you already know what I’m talking about. Yes, I agree with you that Lebron’s show was a spectacle and kind of disgusting, but I also found it really funny. We are in an age of ridiculous celebrity and I’m not sure we can always solely blame the celebrities. ESPN is probably just as guilty as Lebron. In fact, I have a few friends that have been boycotting ESPN since. I think it’s kind of silly because ESPN doesn’t know they are boycotting so it seems moot. But anyway, Dan Gilbert is an owner. It’s well documented by players and staff alike that owners often behave in ways that indicate that they believe their ownership of a team extends to ownership of players. Which is a problem no matter what the color of skin the player is. White, black, latino, and Asian players have all complained about it. But you cannot deny the unease that attends such statements of ownership when talking about American blacks taking into consideration the despicable history our country has with slavery. So I disagree with you that the point of Gilbert’s letter was him lamenting the loss of an employee in a spectacular fashion. 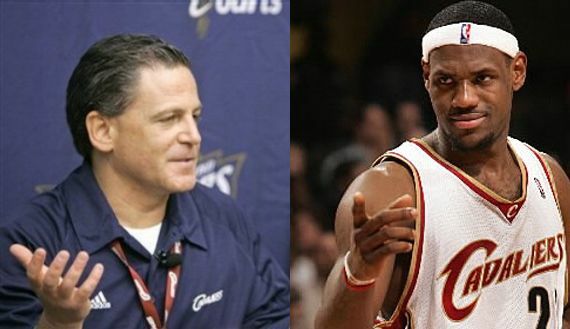 The amount of vitriol expressed by Gilbert also reflects his immature notion that Lebron somehow ‘owes’ Cleveland loyalty, but more importantly, that Gilbert believes Lebron ‘owes’ him, Dan Gilbert owners of the Cavs and its players, loyalty. And that makes me uneasy. My second thought when I read Dan Gilbert’s letter about promising fans the playoffs was “Is that an enforceable contract?” I then debated this with Fortuna Köln who said it’s not because there are no damages. I see damages. No playoff games? Gilbert and Lebron are both assholes. Kevin Durant is a better player and better person than Lebron. And ESPN only showed “the decision” in exchange for burying the story about Delonte West sleeping with Lebron’s mom. I agree with Christopher about LeBron’s passing. That team is now so young, and so fast, and so good at scoring in transition…it boggles the mind. Im looking forward to gaudy fast break statistics and Chris Bosh finally getting some of the spotlight he deserves. If anything, James owned Gilbert, not the other way around. Gilbert did everything the last 7 years to please LeBron and still lost him. Jesse Jackson was relevant and necessary for a time, but now he seems to be scrolling the news, looking for opportunities to rehash the same old platitudes. Question: if one white owner decrying the departure of a black athlete is evidence of racism and a slaveowner mentality, does that also mean the hundreds or thousands of other times other white owners DIDN’T decry it is evidence they are NOT racist or do not have that mentality? Awesome,I admire Miami Heat! They are the most talented team in bball! We will never ever see another power houseteam like this again! Go D Wade! most service providers of these plans will stick to what is recommended by the manufacturer. It is even cooler to know where they are) You may need to remove the hubcap or wheel cover by prying it loose with the tire jack.